Yesterday was Thanksgiving, and we know you made Fat Kid Fridays proud. But it's not over yet. The day after Turkey Day is basically another holiday, and sometimes turkey on Wonder Bread just doesn't cut it. Luckily, we've rounded up alternative ideas to punch up the leftovers, including cinnamon roll stuffing and a sweet potato loaded with s'more fixin's. You can go ahead and thank us... it's not too late. This might not seem fat enough for our very high, very large standards, but sometimes, you have to concede to genius. 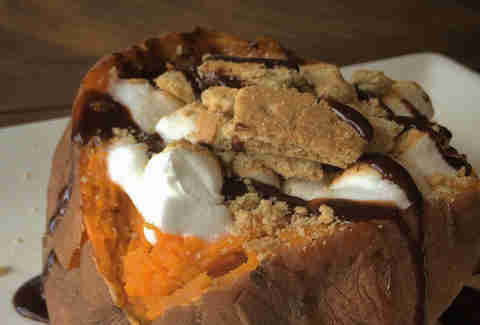 And sometimes, genius means the unholy union of a roasted sweet potato and a s'more, which was brought to us by the ever-imaginative Vulgar Chef, who may also be a counselor at fat camp. Stuffed with all the requisite s'more materials -- marshmallows, chocolate, and grahams -- this thing puts your Mom's mallow-covered casserole to shame. What's better than mac & cheese? 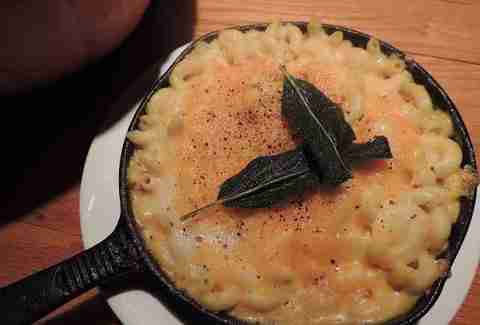 Five-cheese mac & cheese. And what's better than five-cheese mac & cheese? Pumpkin five-cheese mac & cheese, oddly enough. And that's exactly what DC's Black Squirrel is servin' up. Full of bechamel, goat cheese, Brie, Parmesan, cheddar, and Manchego, plus pumpkin-sweet potato puree, this completely destroys roasted squash as a side. Not that it was too hard. You might think there's no way to make mashed potatoes better, but that's just because you haven't added bacon and fried them yet. 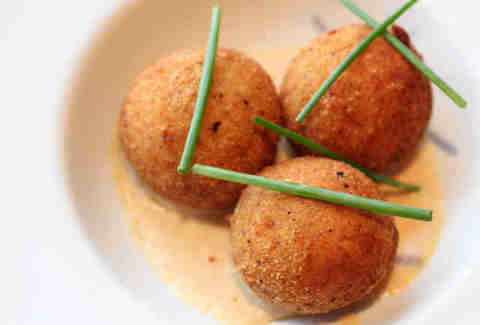 This recipe combines mashed potatoes with cheddar, sour cream, chives, and loads of bacon, then the mixture is formed into bite-size, poppable balls that are panko-breaded and fried to a crisp. This recipe will supply you with a whole bunch of balls, which, might we add, will work great for a family food fight whenever you want Uncle Mike to stop talking about the economy. You know how every Turkey Day you think to yourself "this Thanksgiving could use more cinnamon rolls"? Well, we've all been there, and our prayers have been answered, thanks to this revolutionary stuffing recipe that uses glazed cinnamon rolls, veggies, and bacon for a sweet & smoky shock to your usual holiday feast. True to its name, if you eat too much of this stuff, someone might soon be rolling you out of the dining room. That being said, you should probably eat too much of this stuff. 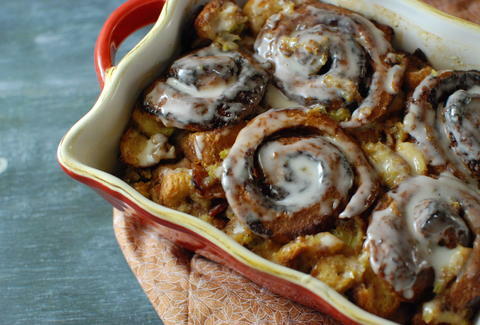 Rachel Freeman is a Food/Drink editorial assistant at Thrillist, and is approximately 97.5% sure cinnamon roll stuffing is the way to her heart. Follow her to gratuitous gluttony: @rachelifreeman.